The first pad washing system that works with DUAL ACTION polishers! The Grit Guard Universal Pad Washer is the first and only pad washer that cleans all types of buffing pads on dual action and random orbital buffers. Clean foam pads, wool pads, buffing bonnets – you name it! The unique design of the Universal Pad Washer accommodates any dual action polisher to clean pads without even removing them from the machine! The Grit Guard Universal Pad Washer uses the power of your polisher to agitate pads. 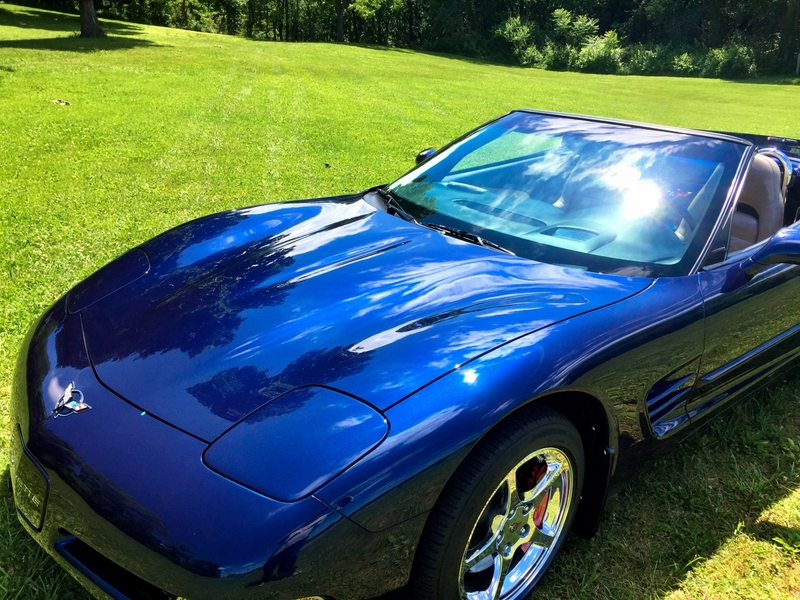 You don’t have to scrub and scrape – just let the polisher do the work for you. Insert the pad into the pad washer, turn on your polisher and let the grid insert clean and dry all your buffing pads. Unlike other pad washing systems, the Universal Pad Washer works with all polishers. The grid insert’s large diameter allows pads of all sizes to make contact, no matter how big the orbit. Even the Cyclo can be used with this pad washer! The opening of the pad washer is adjustable to accommodate any pad size and polisher. Clean pads on your Porter Cable 7424XP, FLEX XC 3401 VRG, and Meguiars G110. The Grit Guard Universal Pad Washer accommodates all dual action polishers. Clean pads with the Splash Guard closed. The grid insert’s height is adjustable. Simply press your polisher down until the pad is in the water and making contact with the grid. The grid insert is supported by springs so no manual adjustment is needed. Just press down and turn the polisher on at its slowest speed. The downward force pumps water upward to help clean the pad. 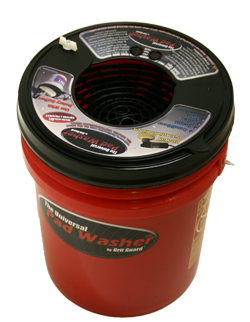 The Grit Guard Universal Pad Washer includes the pad washer complete with Splash Guard, the Extension, a Gamma-Seal Lid, and a 4 oz. spray bottle of Pad Renewing Solution. The grid extension can be strategically placed on the grid insert to provide more agitation on heavily soiled areas of the pad. Position the grid extension in the middle of the grid to clean the center of the pad. Position the extension off-centered to clean the outer edge of the pad. The Gamma-Seal Lid allows you to seal the bucket in order to keep dust out, or to store water or pad cleaning fluid for later use. (Some pad cleaning concentrates can be reused several times. This is especially convenient for professional and mobile detailers.) The Gamma-Seal Lid forms a water-tight seal so you can transport the pad washer without spilling its contents. The Grid Extension can be positioned anywhere on the grid insert. The Pad Renewing Solution works with all types of pads and polishing balls. The biodegradable cleaner removes petroleum and water-based car care products from wool fibers and porous foam. Before using the Dual Action Pad Washer, spray the pad with 4-5 spritzes of Pad Renewing Solution. It will help break up oily residues inside the pad as you operate the pad washer. Not only does the Grit Guard Universal Pad Washer wash pads, it dries them! Simply lift the pad out of the water and raise the speed setting slightly. Allow the pad to spin until the excess water has been removed. Try this advanced drying technique: Remove the grid extension from the grid and place it where the Splash Guard lid says “Dry Pad Here”. 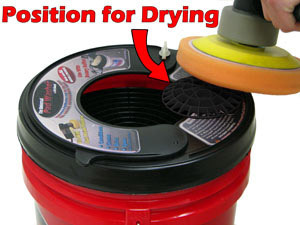 Operate the polisher while pressing lightly against the Extension in order to dry pads faster. 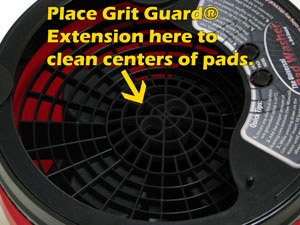 The Grit Guard Universal Pad Washer works with rotary polishers, too. Clean pads on your FLEX LK603VVB, Makita 9227C, DeWalt 849, or any other high speed rotary machine. The same instructions apply. The Grit Guard Universal Pad Washer is incredible! It prolongs the life of your pads, saves you time when cleaning up, and it works with any polisher. If you are in search of a convenient and efficient way to clean buffing pads – no matter what kind of polisher you have – the Grit Guard Universal Pad Washer is exactly what you’ve been looking for. Move the grid extension to the area marked on "Dry Pads Here" and work the pad against it to remove excess water. Keep the pad’s Velcro® brand backing out of the water when using the Grit Guard Universal Pad Washer. 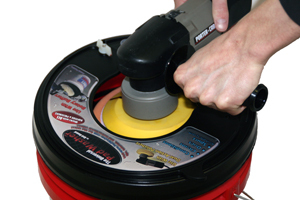 When using a dual action polisher, make a mark on the backing plate with a permanent marker. This mark will indicate to you when the pad has made a full rotation. If it is not rotating, lighten up your pressure. Fill with the appropriate level of water. Press down on the grid insert until the springs are fully compressed. Fill until the water level reaches just above the Insert. When you press down on the grid insert with the polisher, the springs will pump water upwards to the pad. Always operate the pad washer with the Splash Guard closed. For heavily soiled pads, spin the pad in the pad washer for 10 seconds to thoroughly wet it. Then spray on the Pad Renewing Solution and let it penetrate for 1 minute. Then use the pad washer again to clean the pad. Always use the Dual Action Pad Washer with the polisher on its lowest setting for cleaning. You can use a slightly higher setting for drying. Move the polisher around inside the pad washer to be sure all parts of the pad are cleaned. Please call for a shipping rate quote for expedited service on this item. This is a game changer! No longer do you have to use an over loaded pad allowing your pads to work harder for you. Keeping your pads clean during your detailing session allows you to complete the job faster. Cleans wool pads amazingly fast! Although a bit of an investment itâ€™s time savings makes it a great value. 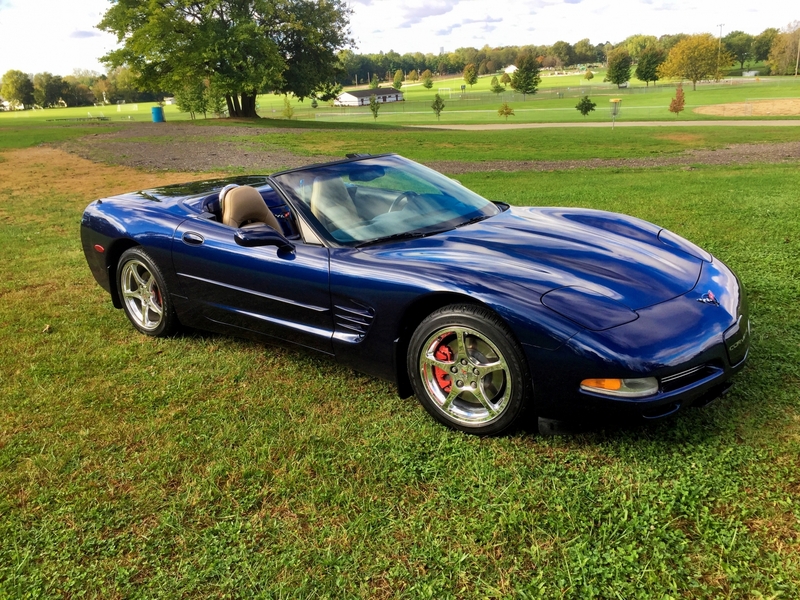 I own a car dealership and move a lot of vehicles through auction. We buff and polish too many cars a week to keep count. Shiny cars sell, plain and simple. After all these years, we've been cleaning pads by hand or when we had no time, just buying new pads. Some how, I never saw this item and decided to buy it. Best decision I ever made. In 30 seconds, you can have a caked pad looking like new and the thing is so dry you can go back to using the pad on a car right away. Well worth the money. I know a lot of people think this is expensive, but if you are a serious detailer, you will see the value in this item. Time is money. You can spend 5 times as much time trying to clean a pad by hand that won't come out as clean or dry. You'll also save money by extending the life of your pads. The inventor of this item deserves every penny for this ingenious invention. Some times you have to give credit where credit is do and pay the piper. Detailers want the most for their work and the inventor of this item deserves the same. Only gripe I had was water would seep out of the top with the larger pads from a rotary. Not an issue with smaller pads like on a dual action polisher. I'll adjust the water level slightly below what was recommended next time. I'd buy another one of these in a heartbeat! I even tried this on old pads that were around the shop that weren't used in a year or two that were caked with polish and compound. In 30 seconds with little effort they looked just like new pads! What a wonderful tool. It makes pad cleaning effortless. Furthermore, I don't have a ton of pads for my polisher, so intermittent cleaning of the pads when working on the car is a must for me to get a clean, dry, pad to continue on. My friend and I did a paint correction on his car - him with his Rubes Big Foot and I with my 3401. Having the bucket at the ready for both of us was so convenient, and he will now be buying one for himself after using mine. These were on back-order forever. So, I waited. When I saw it was available, I pulled the trigger. Well worth it! I clean pads on the fly easily, and at the end of the day all pads are clean and nearly dry. It is very effective, and works as claimed. I used to hate cleaning polishing pads... now it's a breeze. Great buy... highly recommend this for anyone that uses machine polishing pads often.